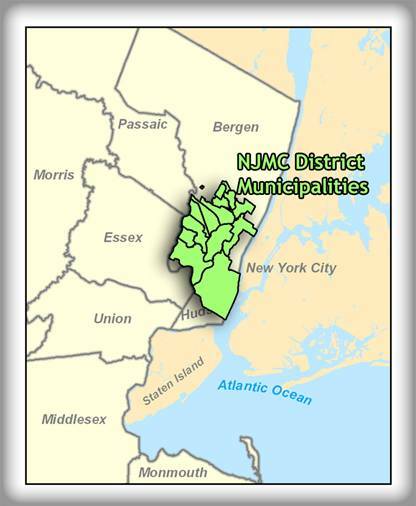 Participants: MERI, Bergen County Municipalities: Carlstadt, E. Rutherford, Lyndhurst, Little Ferry Moonachie, North Arlington, Ridgefield, South Hackensack, Rutherford, Teterboro; and Hudson County Municipalities: Jersey City, North Bergen, Kearny, Secaucus. Municipal database use ESRI’s Spatial Database Engine (ArcSDE) and Oracle 9i to create and manage GIS layers from coverages/ shape files to geodatabase format. MERI-GIS will customize ArcIMS applications to fit the need of the municipality. A user-friendly application is available on the Internet for users to access critical GIS datasets for each municipality. Refer to Interactive Maps. Manuals and training are available to municipal staff for use of the GIS. MERI-GIS is continually updating the State’s parcel data (MOD4) for all municipalities. Capabilities in various modeling and spatial analysis of the Hackensack Meadowlands District and its 14 municipalities. This includes various raster datasets, from Landsat, hyperspectral imagery, to high-resolution ortho-photos. A key component of this program includes the capture of critical data through the use of hand-held GPS units on the field (shown below). 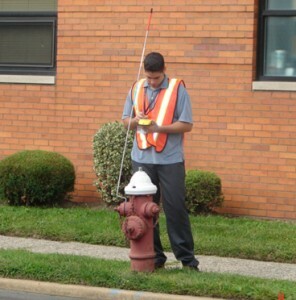 For example, fire hydrants of a town can be mapped to show their location and integrity.